1. Comments on any Blog posts are welcome, both supportive and critical, for or against euthanasia and self-deliverance, but they should follow the tone of the post. Not all comments are published and the editor’s decision is final. ‘Blog posts’ means the dated posts on the main page, the one marked Home on the main toolbar. We don’t encourage you to post comments on this page or elsewhere, only comments on the Blog. 2. Comments should address the post in question, and add something to other readers’ experience. Comments that are not about the subject in the post or considered relevant may be deleted. If you are simply opposed to euthanasia, this is not the place to let off steam. 3. 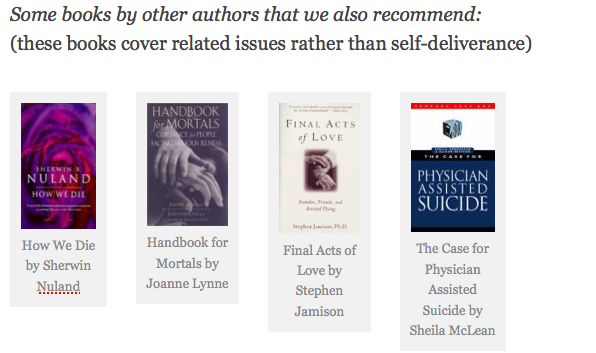 Exit Euthanasia Blog is not a discussion group, nor is it a place to ask for advice on methods of self-deliverance. Discussions are too onerous to monitor for legal appropriateness as well as responsible advice, and therefore we suggest that if you are interested in a discussion on euthanasia you consider one of the many right-to-die newsgroups that are not connected with Exit. Exit dies not offer one-to-one advice on suicide. Our focus is research and publication. 4. If you are looking for further information on methods of self-deliverance, please see our books and publications, or join Exit. Giving one-to-one advice online when we don’t know you is likely to be both irresponsible and in many cases illegal. Exit works within the law, both officially and unofficially! But although we do not provide one-to-one advice (except in group workshops), we are still considered the most extensive source of self-deliverance information and we urge you to consider our books. This is not something that can usually be answered in a quick email! Requests for advice disguised as comments are generally deleted. 5. The comments facility is not a place to give advice either! These are serious issues and we cannot be responsible for third party ‘suggestions’ so they will not be printed. Please see our literature for extensive coverage of the subjects concerned. 6. A comment about helium, for instance, should relate to a blog post about helium on a particular date, and that way it will get the widest audience from people searching the Blog for helium. To post a comment, please click leave a comment at the bottom of that day’s Blog entry, rather than on this Editorial page. It’s inevitable on a blog when links are offered to third party sites that those sites might change the addresses over time. Links are current at the time we post them. However, I’ve looked at the post I think you are referring to, called a “Quick Guide to Dignitas”, and replaced the two dead links with a link to their homepage. From there, it is easy to select he English section and download whatever current documents they are offering. Hope this helps. I occasionally look at Exit websites to see if anything is available that would allow me to die peacefully without trauma and fuss. Much is made of the inert gases and Nitrogen (which is only biologically inert) but a gas cylinder, regulator, and bag over the head is not compatible with my requirement for an end to life. As a retired 87 year old scientific research worker I am surprised nothing better is on offer. There are many chemicals that in small amounts can cause death quickly but with bad though short, symptoms eg. Sodium Cyanide. These symptoms would not be noticed if one was unconscious. Therefore. enclose the Cyanide in a slow release capsule that one takes before taking a strong, quick acting knockout tablet or solution. Why isn’t this ever considered in your literature I have read ? Maybe I haven’t read enough or you have evidence it would fail. We have looked at cyanide in several editions but without recommending it. There has been some research in delaying the release (by means of an enclosing capsule) so that it reaches the lower gut. More recently, research has been directed at cyanide poisoning caused by ingestion of apricot seeds. It comes back to “reliably quick and painless” and with a consideration of side effects if there is any mistake. Successfully painless death with cyanide appears to rely on very rapid ingestion of a high dose to achieve a knock-out effect without the highly distressing symptoms that can occur otherwise. The pharmacokinetics of a reliably fast ‘knock-out solution’ lead us back to barbiturate solutions, as used in Switzerland but are generally illegal and difficult to obtain for non-medical purposes: of course, if you have a supply of barbiturates you are unlikely to need cyanide! We have large files on many ways of ending one’s life but many of them turn out to be unreliable or unverifiable. The millionaire Michael Marin was filmed in court committing suicide with a fast-acting poison but then it comes down, how easy is it to obtain and how reliable is it (was he just lucky?) We know of a few successfully peaceful deaths with cyanide but the majority are not. The literature has now become so large that there is not really room for extended discussion of such methods, but they can be found in the medical literature. The index of the current volume is similarly selective, even when they are discussed. There are also many methods that might work, but where there is simply not enough data available. Having watched my wife die from breast cancer at 47 I cannot understand why we even have to debate this issue in law. The doctors could do nothing more to help my wife and I had to endure weeks of pain watching as my beloved wife suffered needlessly. Personally I will exit via dignatas until this stupid government gets right. Decades ago, barbiturates like nembutal were freely available. It was a commonly prescribed sleeping pill for insomnia. After it was widely used to commit suicide, it was banned worldwide, thus making it very difficult to obtain. I think that a rethink should be made now to enable people to use it for voluntary euthanasia. This will do away with all sorts of dangerous ruses to commit suicide or voluntary euthanasia. It might indeed simplify matters. To do that, a country would first need to make voluntary euthanasia legal of course, then they have to be able to get hold of the drug. In Oregon, where doctor-assisted suicide is legal in certain cases, they stopped using Nembutal only recently. The first reason appears to be price. Pharmacies are charging patients thousands of dollars to fulfil the prescription. Another reason is that the countries that manufacture the drug do not wish to supply it to America, which also wants to use it for judicial executions (Europe regards capital punishment as barbaric.). Nembutal is still used in European countries where voluntary euthanasia and assisted suicide are lawful. Nembutal should be available legally on request by prescription for “Insomnia”. If the real reason for the request is voluntary euthanasia so be it. If the doctor “believes “the patient has good grounds for accelerating his death he prescribes Nembutal, if not some less strong barbiturate. The doctor is in the clear because he does not “know” the reason for the request. I greatly appreciated the post on “appropriate” death. Having had Drs. Weisman and Hackett as mentors, it was wonderful to be reminded of the relevance and ground-breaking nature of their 1961 article. Many thanks! There are many online support groups for cancer and a host of other diseases. Usually I think one is forbidden or strongly discouraged from discussing suicide. This blog is wonderful; why don’t you or any others you may be connected to, start an online support forum for people considering or planning LEGAL assisted suicide or choosing palliative care. There so many issues surrounding these things that are not addressed in cancer forums or dementia forums. I find it hard to believe that there isn’t a place to go for online support. It’s a great idea, Lucy. I guess the main reason is resources. There are some very awkward legal areas that people can get into discussing legal assisted suicide. The law in the UK, where we are based, forbids anything that can be construed as encouraging another person, so even discussing it is a legal tightrope. Monitoring such a forum for well-meaning posts but which could nevertheless see someone arrested is more than we have legally skilled personnel to do. We concentrate on what we can do, and which we have the experience and resources to do, and that is research and publication. Palliative care is less of a problem legally. There are a number of support groups and the only problem is that they sometimes airbrush the truth. For instance, most pain and suffering is relievable (given the state of medical knowledge) but a large proportion is not relieved in practice, either because of shortage of specialists or money (hospices, for instance, are incredibly costly per head, and they also, quite naturally, tend to focus on diseases where they can make the biggest difference, such as cancers; palliative care for heart disease is poor by comparison). Another problem can be the eternal optimism of “there’s always something that can be done” — which is true — though it might not make the difference that the patient wants. Most people who opt for assisted suicide have simply had enough of years of coping with their illness. Yet palliative care in many cases is excellent. We strongly recommend investigating it fully and calmly, to the utmost of your ability, before seeking assisted suicide, euthanasia or self-euthanasia. If you search the Blog (search button in the right hand panel) you’ll find various articles on things like Dignitas and palliative care. There’s also extensive chapters covering these in our books. But Exit’s primary focus is self-euthanasia (‘self-deliverance’) and we do work that no-one else is doing, so I think we have to continue to prioritise that. Hope this helps. I am watching my mum die of cancer. A strong, proud, independent woman, I know she never wanted to end this way. The dr keeps telling us she is physically comfortable….. but in her eyes, I see the mental agony she is in. I wish I could help her find peace. I am turning 65 end of this yr and I am in good health. However I feel as human beings we should have the right to exit our world when we are of sound mind and ready to leave this world. I do not want to be placed in a nursing home at the end of my days, I just want to exit with dignity in my sleep..